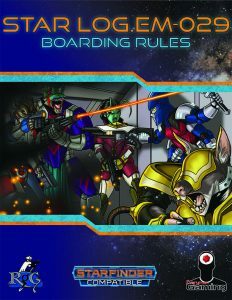 Absolutely fantastic and concise file that provides proper Boarding Rules! This Star Log.EM-installment clocks in at 8 pages, 1 page front cover, 1 page editorial, 1.5 pages of SRD, 1 page blank, leaving us with 3.5 pages of content, so let’s take a look! We begin this supplement, as has become the tradition with this series, with a brief note on the tradition of boarding and consequences in the Xa-Osoro system. After that, we begin with, no surprise there, the boarding rules. Docking or Landing a starship are concisely defined as new Piloting tasks, but invading a space station or enemy ship is another deal. One of the options here would be to breach a starship’s hull: When hitting a starship with a starship weapon that deals at least 1 Hull Point damage, the hull becomes breached until the end of the gunnery phase, after which the breach is automatically sealed. If the enemy ship is hit with an attack or board weapon, the breach instead remains for as long as the weapon remains attached or embedded. Alternatively, adjacent beings (e.g. on the hull with magnetized boots, Dead Space-style), you can use explosives to breach it, using Critical threshold as hardness. As far as weaponry is concerned, the pdf does include adamantine boring drills and claws for direct fire weapons; insertion pods as tracking weapons, intrusion pods as a heavy tracking weapon, and there also is a capital weapon version of pods, and we get a gravity vortex here. Wait…Board and attach? Yep, the pdf does define these in a concise and sensible manner. Additionally, and much to my joy, these do actually work in conjunction with the ship arms that you could get in the Star Log.EM-pdf on expansion bays. (And no, the latter is not required to make use of the options in this pdf…) Unsurprising, the presence of these weapons, and weapons like claws and drills do mean that a melee range for starship weapons needs to be defined. Which this pdf also does. Alternatively, you can attempt to override a starship’s docking ports – you can try to override these with Computers – this is a concisely defined new Computers task. PCs acting as boarding parties (with CR-suggestions for resistance faced) are covered. Similarly, if the PCs are more into starship combat, then the new captain action to apprehend boarders can make them lay down their arms – provided your Diplomacy is ace. Science officers can override enemy docking ports during helm phase…and that’s it! Concise, easy to grasp and succinct boarding rules. Editing and formatting are top-notch on a formal and rules-language level. I noticed no glitches. Layout adheres to the 2-column full-color standard of the series, and the artwork presented is nice. The pdf has no bookmarks, but needs none. David N. Ross’ boarding rules are fantastic. They are easy to grasp and painless to implement. Do yourself a favor: Print this, then attach it to your core rules – for that is where these should have been. Starfinder is a young system, but even in its brief existence, I’ve been asked, time and again, for boarding rules. Well, this delivers, and it does so with panache aplomb. 5 stars + seal of approval, plus, this is designated as an EZG Essential for Starfinder. If you’re like me and were always dissatisfied with the lack of means to represent cool boarding scuffles, then this is a pdf you will never want to miss in your games. You can get this inspired, super-useful pdf here on OBS! The expansion bay file I mentioned can be found here!